One of the key TRX’s benefits is that you are able to complete endless number of exercises with a single training tool. Given that you can boundlessly adjust your body position to add or decrease resistance, this workout is safe and effective for people of all fitness levels. 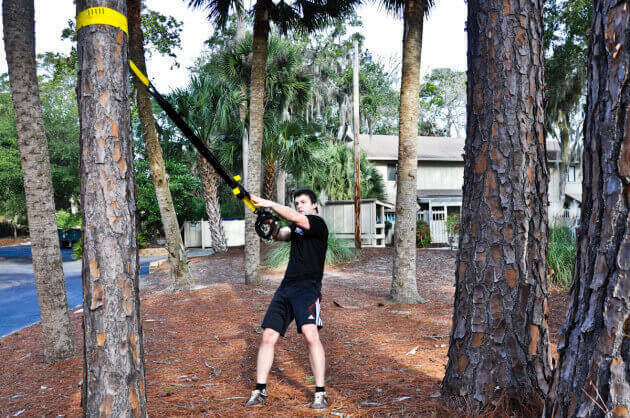 TRX is portable and provides greater performance and functionality than large exercise machines costing thousands of dollars. What Are The Benefits of TRX Training? TRX training is a workout you’ll never outgrow! The centre of gravity in the human body lies right above our hips along the central axis of the body. Centre of gravity changes with every move of your body. However, it stays within the limits of the body when you do regular common activities. While moving, the body controls the centre of gravity with muscles. Suspension training allows you to deliberately change your centre of gravity, which challenges your muscles. Whatever your goal, wherever you train, take your performance to the next level! Do you have what it takes? 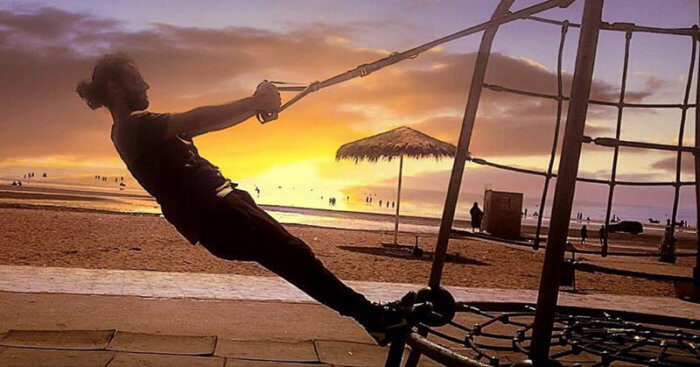 TRX Suspension Training develops your strength by utilizing functional movements and dynamic positions that are performed not only when lying on your back on the ground, which is typical for traditional abs exercises. Besides that, the TRX system offers a whole range of movements focusing on abs solely. Body workout is not complete without exercises challenging your back, shoulders, chest, hips and legs. 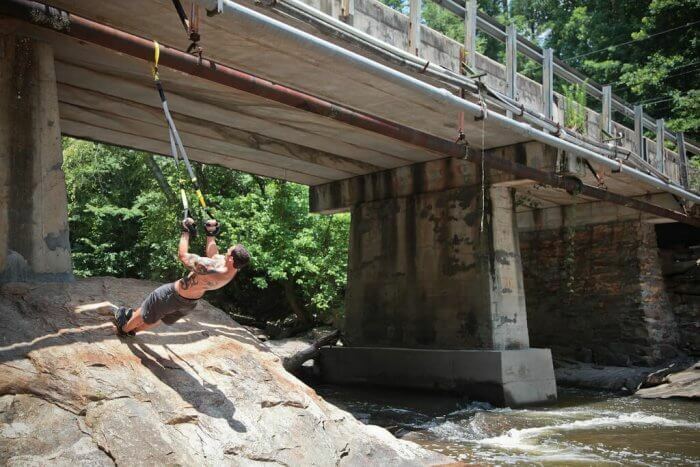 That is why we say that TRX Suspension Trainer delivers a total-body workout. Suspension training allows you to adjust your body in countless angles to complete every exercise possible. TRX gives you an opportunity to design exercises that challenge the entire body in every plane of motion. Doing sports and everyday exercises require our bodies to move in various planes. Suspension training enables you to do multi-planar exercises, just the way we do in every movement we produce. It does not require that you sit down and do an exercise focused on one isolated muscle in a single plane. TRX developed the 12-week, progressive Tactical Conditioning Program to help people of all fitness levels safely develop the strength, power and core stability needed to do their jobs and everyday life. Look around most health clubs and you will see exercise machines with seats, supports and benches. Sitting down while doing exercises lessens the opportunity to develop postural and stabilizing muscles that are critical for effective movement. Training while standing, or engaging the whole body, forces you to control and strengthen the body’s stabilizing muscles. Many modern workout programs find their origins in isolated bodybuilding philosophy. It is essential to understand the quality and limitations of both, isolation and integrated exercises. With TRX, you become fitter and improve your joint stability and muscle balance, which is a direct by-product of the “standing postures” performed at TRX. Isolation exercises are minor, one-off events during which you focus on and work only one muscle group at a time, often in one plane of motion. While such exercises may be effective for developing muscularity, they are generally simpler movements with limited neuromuscular development benefit. Integrated exercises engage intensive, interconnected movements, often multi-planar, which require coordinated efforts. This type of exercise enhances the nervous system’s ability to effectively coordinate movement at higher levels and build strong motor patterns, increase stabilization and functional muscle mass. If you work several muscles or muscle groups at one time in wide variety of movements through a wide range of motion, the muscle mass grows proportionately and evenly, decreasing the risk of injury during sports and increasing overall performance. Whether your goal is to rehab an injury, increase general fitness or compete at an Olympic level, TRX Suspension Trainer can help you in doing so. TRX Suspension Trainer enables strength training to occur in any movement that the human body accommodates – specifically along all three planes of motion (frontal, sagittal/front-to-back, transverse/rotational) simultaneously. Traditionally, weight training programs have divided the body into its main muscle groups (chest, back, legs) and trained them individually. This is an easily digestible approach, and, when executed properly, it yields the aesthetic muscle growth that bodybuilders seek. Life and sport demand significantly more of our bodies than standing still and flexing our muscles on a pedestal. The human body works to produce movement. To this end, it makes every attempt to use as many muscles in concert to create action as efficiently and effectively as possible. Life demands us to move freely through space, not within the confines of a machine or other restrictive motor patterns. Isolated exercises contradict the nature of how the body has evolved to move. Most traditional strength programs heavily favour movement in the sagittal/front-to-back plane. This is a programming error that promotes one-dimensional motor patterns and the inability to move with equal effectiveness in any direction. In some cases, this yields joint dysfunction, decreasing the range of motion throughout adulthood while increasing the risk of injury. If not designed properly, the muscle-oriented approach may lead to muscle imbalance, poorly developed launching forms and motor inadequacy in untrained planes of motion. TRX Suspension Training designers have developed effective ways how to lead and follow training program to achieve optimal results in shorter time than in traditional programs. 1) Reduced time spent pacing from one training station to another if you want to train different parts of the body. 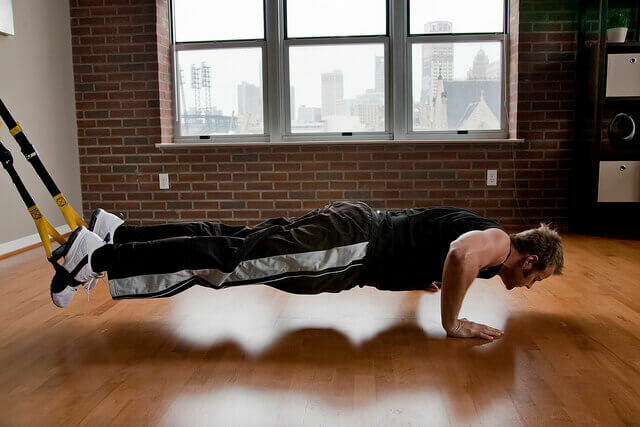 2) The core is challenged in every exercise – the core is more than your abs! The core includes pelvis, abs, back and chest muscles. It is the core that improves your body stability, balance and flexibility. Everything you do in your life connects with the core; whether you bow down to pick up a pen, wash a car or play basketball with the kids. 5) Innovative type of exercise – traditional strength programs favour movement in the front to back plane, presses and curls, all performed mostly while sitting. Such programs include for example bench press, curls performed while sitting, and barbell squats. None of these work with your core. 6) TRX helps prevent injuries – Natural type of exercise and body workout – do we move in our daily lives just forward and backward? Definitely NO! We perform movements in all planes, we move to the left, right, forward, backward, diagonally, etc. Don’t you think it is about the time to start training our body the same way? And this is exactly the reason why TRX helps prevent injuries. 7) More planes of motion challenged – while training with TRX and performing various exercises, you may move in multiple planes. You will build strong and stable core and decrease the risk of injury. TRX full-body workout, and flexibility and strength training can be performed for a period of 30 minutes or less. To strengthen muscles basically means to have an ability to generate and control strength. Effective training tool not only develops the muscle, but also demands stability and coordination. Suspension training is an effective workout system that demands generating and controlling strength in a dynamic and changing environment. This is achieved through an integration of all supporting muscles involved in movement and not only the primary driving force. Every movement you produce while using TRX is demanding for your body in terms of stability and direct forces that later translate into better performance in sports and life in general.